Aam Panna is a delicious and digestive summer drink that pacifies pitta. It is the most preferred drink in India especially during the summer. Aam panna is prepared by boiling the raw mangoes. The pulp of boiled raw mango is nicely blended with cardamom, jaggery, cumin powder and black salt till it becomes a puree. The pulp is poured on a glass of chilled water to make Panna. 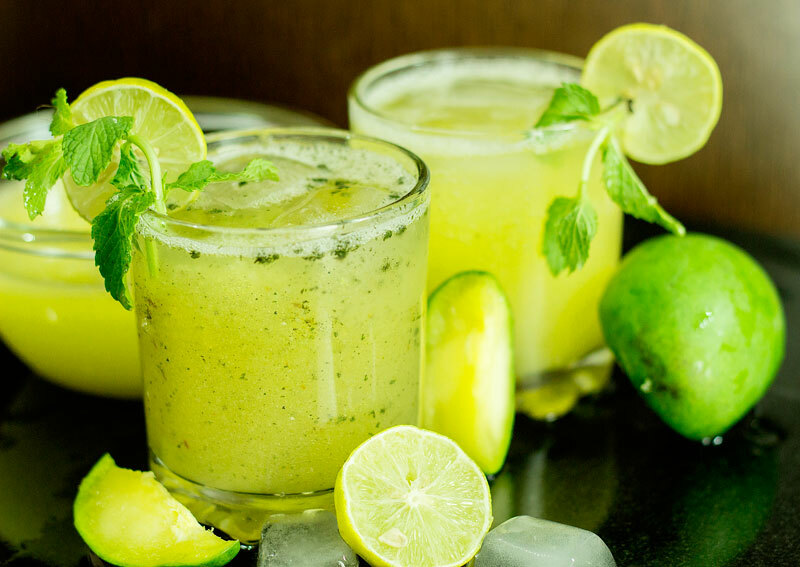 Aam panna is a refreshing summer drink which is made from raw mangoes. The tangy and sweet Aam panna rehydrates the body and provides the vital electrolytes. A glass of Aam panna curbs fatigue and enhances stamina. It is rich in carbohydrates, Vitamin A, Vitamin B1 & B2, Vitamin C, iron, sodium, potassium, magnesium, folate, choline, pectin and calcium. A glass of Aam panna balances the electrolytes as it is rich in minerals. Electrolytes are vital as they provide energy, curb fatigue, maintain pH and regulate fluid balance. Aam panna also keeps heat stroke at bay. Anemia is a condition where hemoglobin level is quite low which can lead to fatigue, short breath and heart ailment. Aam panna is extremely beneficial to treat anemia as it is packed with iron. It contains high quantity of Vitamin C which help is preventing scurvy and also enhances the absorption of iron. Antioxidants present in raw mangoes strengthen the immune system. Aam panna also curbs gastrointestinal ailments. Raw mangoes contain several acids that trigger the secretion of bile which acts as a healing agent for intestines. This makes Aam panna an excellent drink to have for your gut health. Previous articleHow Many Calories Are There in Nimbu Pani & Does It Have Any Health Benefits? Next articleHow Many Calories Are There in Ganne Ka Ras (Sugarcane Juice) & Does It Have Any Health Benefits?